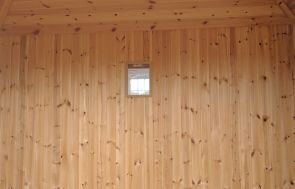 This attractive 3.0 x 3.0m Holkham Summerhouse has been installed in our customer’s rural garden in Comberton, Cambridgeshire to use as a garden retreat, allowing them to write and relax in comfort and peace. 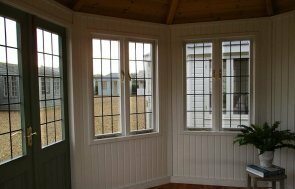 To help the customer get the most use out of their new summerhouse, they opted to have double glazed windows, full insulation, and an electric pack, which will ensure they can use the building in the cooler months of the year, as well as in the summer. Cedar shingle tiles add to the traditional, country feel of this Holkham, along with the Georgian windows, and to finish it off, the customer chose our Valtti Paint Range, in the neutral colour, Ash. Internally, the Holkham has been finished with painted matchboard lining in Ivory, and a Natural lacquer on the floor. 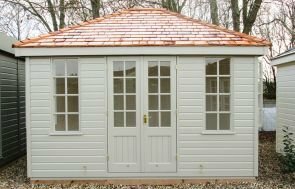 If you like the style of this Holkham, you can create your own by using our Online Garden Building Planner Tool, or you can also look at the rest of our Garden Studios and Garden Rooms, if you would like something slightly different that you can use all through the year. For more information please call us on 01760 444229, Contact Us or Request a Callback and we will more than happily help answer your questions.